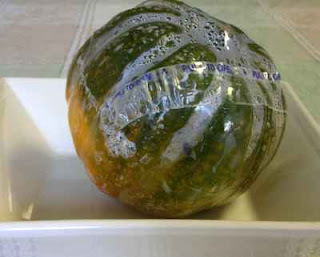 A rose is a rose is a rose ... but NOT when it comes to "commercial" squash, the ones you pop in the microwave for six minutes. What comes out is NOT squash but ... yuck. First let me be clear: what I'm talking about in this post is a 'commercial' squash that's been specially processed for cooking in the microwave. And please, before concluding I have some romantic attachment to "fresh only" vegetables, it's just not true. I support this product on its face. I like the idea that a whole acorn squash can be on the table in about 10 minutes. I like the fact that it's easy to cut the squash in half to serve. I like the fact that it might actually help more people enjoy healthful winter squash. I promote cooking vegetables in the microwave. I don't even mind that the price is 4 times one that requires oven roasting. What I DO object to is the flavor: NONE. Watery. Wimpy. Like, um, water, wimpy flavorless squash. What I DO object to is the waste: half the squash was uncooked, so even if you wanted to eat it, you couldn't because it's undone. Go back to the lab, people. This is not worth a penny, let alone two bucks. And I promise, it's easy-easy to roast squash in the oven! (And I recommend roasting an extra, there are so many ways to use up leftover squash. All the recipes using cooked squash are specially marked.) That said, I must try microwaving winter squash, I know others have good success. Too bad. I find sweet potatoes loose their flavor in the microwave too. Kelly, I disagree! First let me be clear: what I'm talking about in this post is a 'commercial' squash that's been specially processed for cooking in the microwave. It's NOT a 'real' acorn squash --- although really, I must try that for I know others have good success. Second, my own experience with cooking sweet potatoes in the microwave is very positive, both with a sweet potato convenience product and my own recommendation, a delicious 'real' sweet potato. Sometimes slow cooked can't be done fast. I love my microwave but I don't look for it to roast. Interesting idea. Tanna, Outed, for sure. :-) This product just incensed me. If this is someone's 'first' or 'only' experience with acorn squash (and by extension, any vegetable ...) no wonder they 'hate' squash. I would too! This would NOT appeal to me either. I wouldn't be able to tell how old the squash is. Ha. How do you judge the age of a winter squash, Meg? Alanna, thanks for speaking up for taste. The simplest vegetables may have the best taste, as nature entices us to eat food that ...oh, makes us GLOW! I like to cut my winter squash in half, scoop out the seeds, and steam it with a little water in the bottom of the biggest covered cookware I own. Except for the slow roasted tomatoes, I hesitate to run the oven. And to be contrary, I've also made fabulous squash in a romertof (clay pot), with tomatoes, onions, peppers, soy/curry sauce. I am completely with you on this one. Why bother - what is the harm of putting the oven on 40 minutes in advance of the meal. Are we all so rushed out of our minds that we cant plan at all any time for our mealtimes? I am a working mum but I do think that some things are worth spending time on - and eating vegetables is one of them. We havent yet seen this convenience squash in the uk but I know what to do when it arrives! To judge the age (freshness & quality) when I buy them I can tell by looking at it, touching and smelling it. How about you? I think the plastic masks this. Then again if I only had a microwave and a craving for squash...I might give it a try! I cook acorn squash in the microwave quite often, but I've never seen these specially made microwave squash, let alone tried them. The "real" squash that I use has always come out well in the microwave. What I usually do is microwave the whole thing for two minutes, turn it so a different part is touching the plate, and repeat this until I've gone around the whole squash. Then I take it out, cut it, and finish nuking it cut sides down, which takes a few more minutes. I roast it in the oven when I have time, but often don't.